The German Institute for Development Evaluation (Deutsches Evaluierungsinstitut der Entwicklungszusammenarbeit; DEval) is mandated to evaluate the performance of German development cooperation interventions. 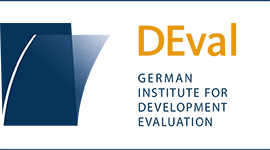 Through its evidence-based evaluations and related work, DEval provides greater transparency about German development cooperation. The institute supports the German Federal Ministry for Economic Cooperation and Development (BMZ) to enhance its development cooperation policy making and ultimately to increase the effectiveness and impact of development interventions by Germany’s implementing organizations and NGOs. The German Development Institute / Deutsches Institut für Entwicklungspolitik (DIE) is one of the leading research institutes and think tanks for development policy worldwide. DIE draws together the knowledge of development research available across the world, dedicating its work to key issues facing the future of international cooperation. DIE's research is theory-based, empirically backed, and application-oriented. Research and policy advice provided by DIE aims at informing public opinion on the theory and practice of development policy and international cooperation towards sustainable development. Research and advice relies on international networks with partners from academia and think tanks and from practice, and is organized in four programmes: (i) inter- and transnational cooperation with the Global South; (ii) transformation of economic and social systems; (iii) environmental governance and transformation to sustainability; (iv) transformation of political (dis-)order: institutions, values, and peace. The Bonn Alliance for Sustainability Research/ Innovation Campus Bonn (ICB) network is a group of major players in this area, namely the Bonn International Center for Conversion (BICC), the German Development Institute / Deutsches Institut für Entwicklungspolitik (DIE), the Hochschule Bonn-Rhein-Sieg, University of Applied Sciences (H-BRS), the United Nations University Institute for Environment and Human Security (UNU-EHS), the University of Bonn with its faculties and the Center for Develop­ment Research (ZEF). These institutions have founded the Bonn Alliance for Sustainability Research during the World Climate Change Conference in 2017. The goal of the ICB is to further expand the research within the Bonn Alliance as well as to attract further partners and to act as an integrative platform for stakeholders in science, politics and the economic sector as well as interested citizens for collective work on our sustainable future. The United Nations University (UNU) is the academic arm of the United Nations and acts as a global think tank. The mission of the Institute for Environment and Human Security (UNU-EHS) is to carry out cutting edge research on risks and adaptation related to environmental hazards and global change. The institute’s research promotes policies and programmes to reduce these risks while taking into account the interplay between environmental and societal factors. Research areas include climate change adaptation incorporating insurance-related approaches, environmentally induced migration and social vulnerability, ecosystem services and environmental deterioration processes, models and tools to analyze vulnerability and risks linked to natural hazards, with a focus on urban space and rural-urban interfaces. Research is always conducted with the underlying goal of connecting solutions to development pathways.